Resistance options range from 100ƒ¶ to 221kƒ¶. VISHAY Intertechnology, represented in Australia by Braemac , has released two series of flat chip resistor arrays that integrate four thin film resistors into a single 0612 surface-mount package. The Beyschlag ACAC 0612 precision series and ACAC 0612 professional series resistor arrays are suitable for applications that demand high component densities and accurate and stable resistor performance. The ACAC 0612 precision series resistor arrays have an absolute TCR of 25 ppm/K and tracking TCR of 15 ppm/K. A tracking TCR of 10 ppm/K is available on request. The ACAC 0612 professional series resistor arrays feature absolute TCR of 50 ppm/K, with 25 ppm/K available upon request. The ACAC 0612 precision series arrays have absolute tolerance of 0.25% and matched tolerance of 0.1%, while the ACAC 0612 professional series arrays have absolute tolerance of 1%. The resistor arrays have a footprint of 1.6 mm x 3.2mm, a reduction of about 40% when compared to the use of four discrete 0603 resistors. Resistance options range from 100ƒ¶ to 221kƒ¶ and arrays are available with four equal values, four different values, or two equal value pairs. Maximum power dissipation for the new arrays is 0.3W, with individual resistors rated at a maximum of 0.1W. For arrays with differing individual resistance values the Rmin/Rmax ratio is 1:10 for the professional series arrays and 1:5 for the precision series arrays. Tolerance matching of 0.1% in the case of the precision series arrays ensures reliable and stable fixed resistor ratios. The ACAC 0612 resistor arrays are suitable for use in voltage dividers, feedback circuits and signal conditioning functions. Applications include automotive engine control units, climate control, transmission controls, driver safety systems, mobile telecom base stations, medical instruments, precision measuring equipment and high-end audio amplifiers. The arrays can also be used in sensing and management systems for PSUs and battery chargers. 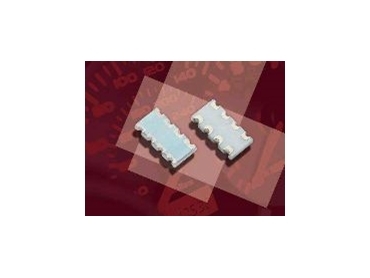 The ACAC 0612 resistor arrays are lead-free and the pure tin plating provides compatibility with lead-free and lead-containing soldering processes. Extensive testing has proven the immunity of the plating against tin whisker growth, and the resistor arrays comply with the CEFIC-EECA-EICTA list of legal restrictions on hazardous substances (RoHS).